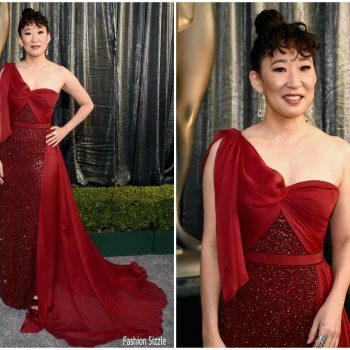 Sandra Oh attended the 2019 SAG Awards on Sunday (January 27) in LA. She wore a crimson Jenny Packham Fall 2018 gown with Atelier Swarovski Fine Jewels along with a pair of Gina heels. Emily Blunt in Jenny Packman- 2014 Hamilton Behind the Camera Awards at The Wilshire Ebell Theatre in LA.